I suppose it was only a matter of time before I needed to start buying greenstuff in "bulk." I've always bought the little GW package because it's always been enough. But recently, I've been grinding through them quicker and quicker. And I don't waste the stuff either. Very often, people find themselves having mixed way more than they needed and end up throwing away as much as they used if not more. I'm past that mistake these days, but I'm just sculpting so much, that I'm using it up in no time at all. Enter the BIG TUBE of greenstuff. I swung by my FLGS (Game Vault) the other day to buy some paints and more greenstuff when the owner told me about the "bulk" tube of greenstuff. I was hesitant at first because I'm comfortable with GW's stuff and using it. I don't want to switch brands and have to learn the subtle nuances of a new product and have to adjust my sculpting techniques now. With a little reassurance though, I bought the stuff (it was cheaper for the amount I got) and I'll be trying it in the coming weeks. As far as projects got, I've been working on lots of little things between the big projects I have going on. These past few weeks, I've tried to limit my spray painting due to the crazy hot temperatures we've been getting here on the East Coast. Here are a couple of sculpting things I've managed to do recently. I was sent a link to this artist (Mr. Scream) and asked if I could sculpt a skull head similar to the one on the model. 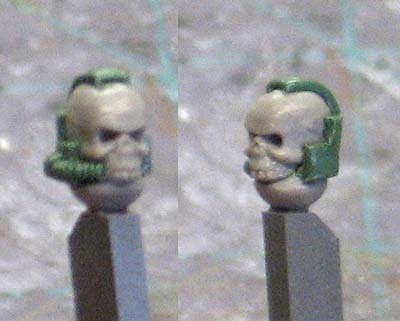 This has to be one of the coolest head conversions I ve seen to date. I'm building another one for myself. I don't know where I'll use it, but I'm going to have one. I've sculpted a set of door icons for another person's Flesh Tearers army. 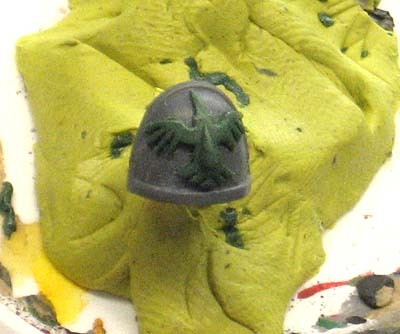 And I've also sculpted a Blood Ravens shoulderpad for another person. While no one project used lots of greenstuff, these with the Dark Eldar project I've been working has just been grinding through the stuff. Maybe the new stuff will last me a bit longer now. I wouldn't worry about the new batch of green stuff mate, Kneadatite are the company that make the green stuff ribbons for GW, so it's exactly the same stuff as you buy from GW, just a hell of a lot cheaper. Yeah its as Corbane says, same company produces it, GW just repackages it. Same story for their primer (automotive primer from an unknown company). Yup, I've been using the bulk stuff for several years. Works great and is a bargain compared to GW's. Hey Ron, where'd you get the skull head from? It's EXACTLY what I've been looking for for my Chappy conversions! Nice green stuff work too! I've used the big tube of green stuff before and I'll give you a bit of advice. Find a new place to store it. 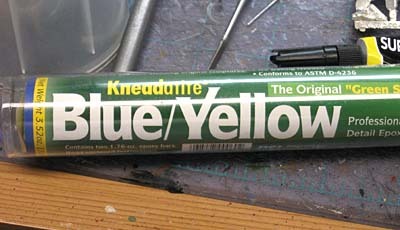 As you use it, bits of blue or yellow will likely get on the outside of the wrappers or leak out from the silvery endcaps of the stuff. Once they stick to the inside of the tube, it can be very frustrating to get the bottom half back out of the tube. I've considered switching to the much more expensive GW packaged stuff just for that reason. Use your head when storing it (unlike me) and you should have no problems. 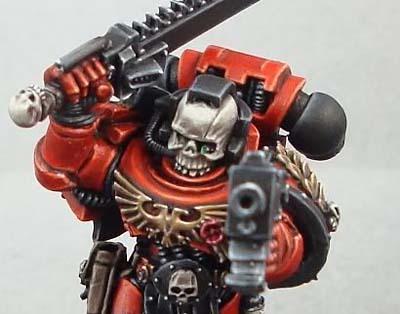 Hello inspiration for a chaplain conversion! One of the plain heads from a box of skeletons should suffice. Luckily I play Vampire Counts and have more than a few spares. As always, nice work Ron. Wow! This stuff you are making is absolutely incredible looking. Nice work! RebelGrot: I cut if off some chain bit I had lying around. Just about any skull will do I suppose. The skull itself is slightly smaller than a regular helmet, but once you add the extra stuff to it, it's the perfect size. Sigismund: That would work too I suspect... you probably have a couple different ones to choose from too. I'm surprised Ron, I thought you would've know about GW's little green stuff racket. Its the same stuff you just bought, just at a higher price. You've been getting ripped off my friend. Spyrle is right, Ron. Store the Blue & Yellow in separate little zip-lock bags. Also if you're going to be a long while between project; keep it in the freezer. Also: that skull conversion is friggin' awesome!